In this story about growing up in a difficult part of America's history, Jake Green is introduced as a cross country runner who wants to be a soldier and am American hero when he grows up. Before he can work far towards these goals, September 11th happens, and it is discovered that one of the hijackers lives in Jake's town. The children in Jake's town try to process everything, but they struggle. Jake's classmate Bobby beats up Jake's best friend, Sam Madina, just for being an Arab Muslim. According to his own code of conduct, Jake wants to fight Bobby for messing with his best friend. The situation gets more complicated when Sam's father is detained and interrogated by the FBI. Jake's mother doubts Sam's father's innocence. Jake must choose between believing his parents and leaving Bobby alone or defending Sam. Winner of the Crystal Kite Award, this beautiful story covers classic middle grade issues. What does it mean to be a good friend? How do you react to a bully? This story makes the events of September 11th even more personal for one boy and draws the readers into his life. Kerry O'Malley Cerra is a former high school history teacher who often enhanced textbooks with historical fiction to bring time periods to life. 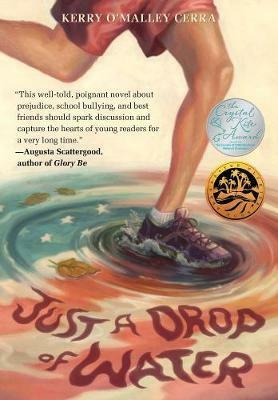 Just a Drop of Water, her first middle grade novel, was inspired by a deeply personal reaction to the tragic events of September 11, 2001. She lives in Coral Springs, Florida.